The only problem with the $10, three course lunch at Opus Too in the International Culinary School in Henderson is only two more days are available to dine there (next Tuesday and Wednesday) before it closes for a break. It will then re-open on July 15th. If you can reserve a table at the tiny, 32 seat dining room, do so. because it not only helps these students hone their craft, it’s also the best friggin’ deal in town for a three course, hand-made, finely-tuned French lunch. And did we mention that the whole kit and kaboodle costs ten bucks? For food like a savory lamb stew, fried goat cheese salad, and sweet, properly sauteed scallops — followed by desserts that would be right at home at any high falutin’ Strip restaurant. Instructor/Chefs Claude Cevasco and Edward Shortsleeve (Claude, French to the bone; Edward, of Algonquin Indian lineage) oversee what is actually a living classroom — the students rotate through in 33 day cycles — with every one of them working as a chef and waiter, in equal portions, during that time. All of the food is made according to classic (mostly French) preparations, and most of it will have you dropping your fork in appreciation. In fact, the onion soup — a deeply rich, long-cooked, onion-laden classic stock, capped with good Gruyere — is among the best versions we’ve had, anywhere. Ditto the pretzel bread. And the jelly roll cake. The menus change every week, so what we enjoyed will be a dim memory by the time a new kitchen crew starts experimenting. But the tiny space, and those students, are so charming, you are guaranteed a good time. One more thing, the place, when it IS open, only serves lunch and dinner Tues.-Weds.-Thurs.. 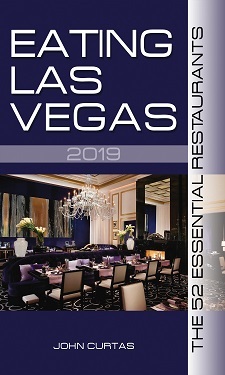 So if you don’t get in next week, you’ll have to wait for the summer session to start to get a taste of Las Vegas’ best restaurant bargain. Believe ELV…it’s worth the wait. Lunch at Opus Too is $10; dinner is $15. The food would be worth it at twice the price. There is a small, moderately-priced wine list. Australian Food and Wine Tasting Event! WHEN MASTER CHEF RAIMUND HOFMEISTER IT WAS IN CHARGE I CAN SAID WOW NOW IS REALY BAD THE PRESENTATIONS OF THE FOOD WHY I SAID THIS MY WIFE IS IN COMPETITIONS FOR A.C.F. AND GRADUATE FOR THIS SCHOOL .IS SAD NOW WHAT OR HOW THE STUDENTS NOW DOESNT NEITHER KNOW THE DANGEROUS ZONE IN THE FOOD.THIS IS OPUS TOO .CHANGE FOR THE WORST .THIS SCHOOL. What did Mr. Ward say? No freakin clue. But I speak fluent Greek and Canadian and it was none of those. Well Mr. Ward, I’m sure people will take your obviously well educated opinion into consideration… There is no better deal in Vegas, just as the journalist states. Perhaps you should actually dine there before stating an opinion. Well that, and learn proper grammar skills. I host a monthly group for lunch and my son is a graduate of Raimond Haufmeister’s school of culinary arts so I admit my bias BUT the students provide an excellent presentation, from serving to cooking. They are professional, outstanding results of an excellent culinary education and the food has consistently been excellent! I applaud their efforts, the chef’s personal hands on touch and their skills. Who is this guy anyway? A graduate of moron schools?